Our 2013 CBF contingent has now made the long return journey home, our tour having come to an end. I consider myself exceptionally lucky to have been included in year’s group. Alongside eleven other exceptional students from across Canada, our professors/tour guides Dr. Andrew Iarocci and Dr. Graham Broad, and, of course, van driver/photographer extraordinaire Amanda, I spent over two weeks journeying through France and Belgium. 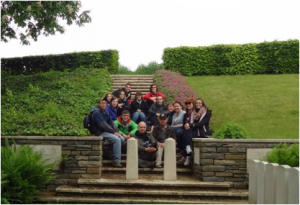 We covered a lot of ground, visiting most of the major (and minor) battlefields, memorials, and cemeteries of both the First and Second World Wars. We literally walked in the footsteps of the fallen, tracing their journeys across windswept fields, through overgrown trenches, and atop hills they once thought impossible to climb. We visited memorials and monuments that stagger the imagination – some whose size and grandeur are only eclipsed by the sheer number of names that adorn their walls, others whose simplicity speaks more of loss and remembrance than words alone ever could. Our visits to the cemeteries had an especially profound impact upon us all. Row upon row of grave markers dot the landscape in this part of the world, reflecting words of love from family and friends or acknowledging the service of someone whose name we’ll never know. Whether large or small, these cemeteries are everywhere, they are full, and they are often overwhelming. 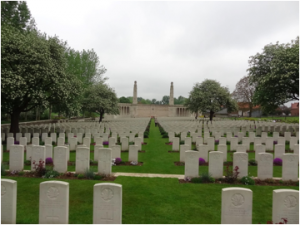 I would say that most of our strongest reactions to this entire experience were often felt in these cemeteries, regardless of the nationality of the soldiers buried there. Plenty of tears were shed, but I also think that our intense grief was at least matched in part by a sense of pride – in the individuals who gave their lives to serve their respective countries, and in the communities that these individuals formed and those subsequently preserved by their actions. Walking among these graves really brought home for me the fact that remembrance is about more than just recognizing those connected to us through family, friends, or patriotism. We are all a part of a larger human community, one in which sacrifice is both mourned and celebrated in equal measure, regardless of which side you take up arms for. The last two days of our journey were spent in ceremonies commemorating the 69th anniversary of D-Day and subsequent push to gain a foothold in France. We had the honour of participating in these ceremonies, laying wreaths at a number of different memorials and meeting those veterans who are still with us and able to make the long return journey to these distant shores. To have an opportunity to shake the hand of these veterans was a humbling experience for us all. I will never be able to adequately describe what it was like to stand on Juno Beach, on the anniversary of D-Day, beside veterans who were responsible for storming its shores sixty-nine years ago. It saddens me to think that these few remaining individuals will leave us far too soon. I would like nothing more than to bring my future children here one day, to make this journey with them and to pass on the importance of remembrance. I know that these veterans will likely no longer be here when that day comes, to share in my children’s understanding of what remembrance really means. I only hope that we can continue to remember and celebrate our veterans – those who fought for our freedom in the World Wars, but also those who have made and continue to make sacrifices in conflicts around the world. Remembrance should not end with the last total war. And it should not be overlooked or impeded because of personal political views regarding the validity of any one conflict. I would like to end this post by recognizing the important role that my 2013 CBF cohort played in making this journey more than just educational. While visiting the battlefields, memorials, and cemeteries certainly formed the foundation of our excursion, our shared experience is what truly made this journey exceptional. For a group of strangers who knew nothing of one another two weeks ago, we have become remarkably close (perhaps too close!… I refer to ‘storytime’ with Eric the Wise). 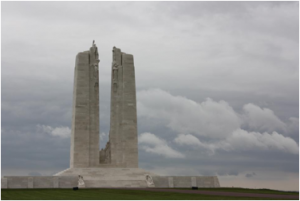 We are all proud Canadians who share a common love of history and a special affinity for the World War period in particular, but we are nothing if not a diverse group. However, despite our differences in age and varied backgrounds we have managed to find a lot of surprisingly common ground. We became a family for the few short weeks we travelled together, and I know that the genuine, honest, and heartfelt openness shown by my tour-mates during this journey was what truly made this experience profound. I want to thank you, my new friends, for making this experience so meaningful. I haven’t laughed this much, cried this hard, or felt so at home within a community for a long time.